My Dad and I are the owners of a 455 that was built by Joe Mondello over 20+ years ago, and it was sitting in a crate ever since it was built and sealed and has never been run. This engine has very nicely ported Iron Batten heads with the aluminum adapters for the intake, 2250 .060 over Arias pistons with (need to look at the build sheet), a forged 455 crank, beam polished rods, a Hydraulic roller cam setup with an Engle cam that specs out at 235/235 @.050 with .532/.532 lift and 108 degree lobe separation, factory-style degreed damper, factory-style flexplate, a Moroso 7 qt. pan, high volume pump with large pickup tube. This is going in a mostly street/ Pro-Touring/some-strip 1967 Olds Cutlass 2dr. Hardtop with a 400 trans, 2800 converter, 3.73 12 Bolt Chevrolet rear with all the good stuff, adjustable upper A-arms and poly bushing lower boxed arms. 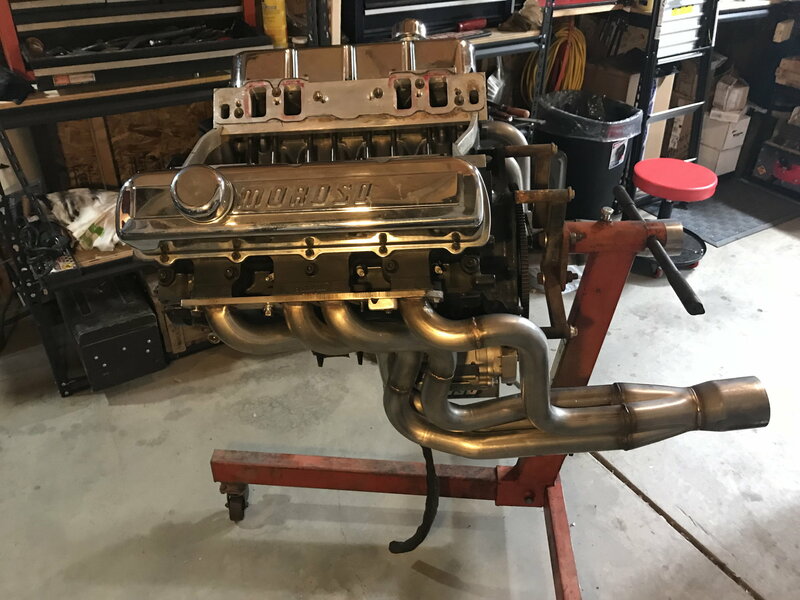 We also have a Professional Products dual plane intake with the fuel injection rail kit that we plan on running, hopefully it won't choke the heads out... We have a Motec M8 fuel injection unit and harness that we will be utilizing for this setup, along with 43lb Bosch Green Giant fuel injectors. We also have a set of custom American Racing Headers with 1 7/8 primaries and 3 inch collectors with custom stainless Batten flanges. We also have a 4 inch bolt-on cowl hood, so induction height isn't a problem. 1. 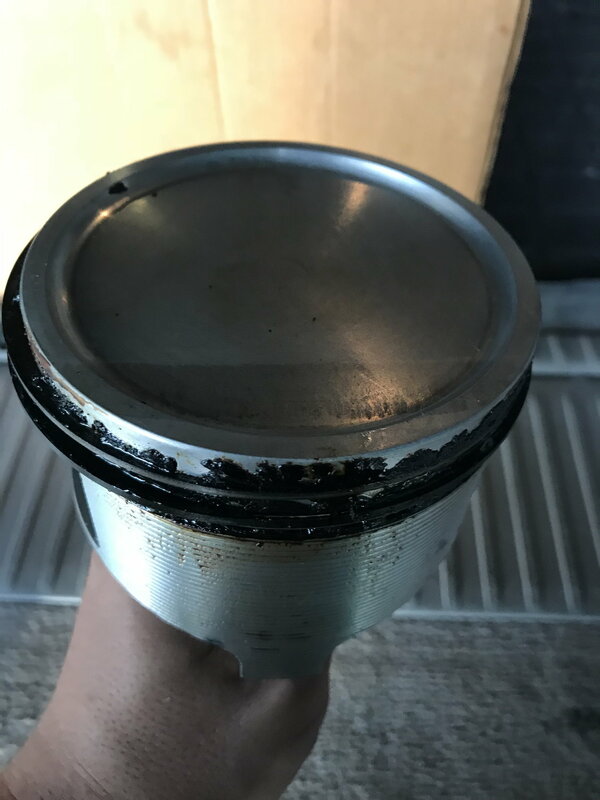 There was an intake mounted to the engine originally, and even though it was carefully removed, my Dad didn't seal off the intake runners well enough and gasket debris and what feels like metal shavings have fallen down the open intake valves and are sitting on the back of the closed intake valves. I obviously wouldn't want to start a new engine or an old one with metal particles waiting to go inside or already there, so a tear-down is going to have to occur. 2. Because we are going to run fuel injection, and because we need as much compression as possible here at this elevation, we are thinking about a different Hydraulic Roller cam with 112-114 degree lobe separation, and possibly upping the duration into the mid 240's on the intake and 250's on the exhaust at .050 with ~ .600+ lift. Also, if we are going to change it anyways, might as well make more power, right? I am not sure what the true compression is..... I will find out soon when I pull the heads off. Anyone here with high-altitude cam timing experience ? 3. After reading too many horror stories about the stock or reworked connecting rods failing or causing failures, I think we are going to buy some form of H Beam aftermarket rods, but I haven't settled for sure. Also, if using a stock 4.250 stroke crank, if I wanted to use GRP aluminum rods, will that require notching the bottom of the cylinder bores? I don't know if the stock rods were bushed for floating pins or not, but I would assume that the Arias pistons would have provisions for locks (I hope). 4. I am wondering if we should replace the degreed balancer for an ATI SFI approved one and also Replace the Flexplate for an SFI approved one as well. I don't think we really plan on going above 6,000 rpm, but, with a good enough bottom end and enough airflow, it is possible. Thoughts? 5. 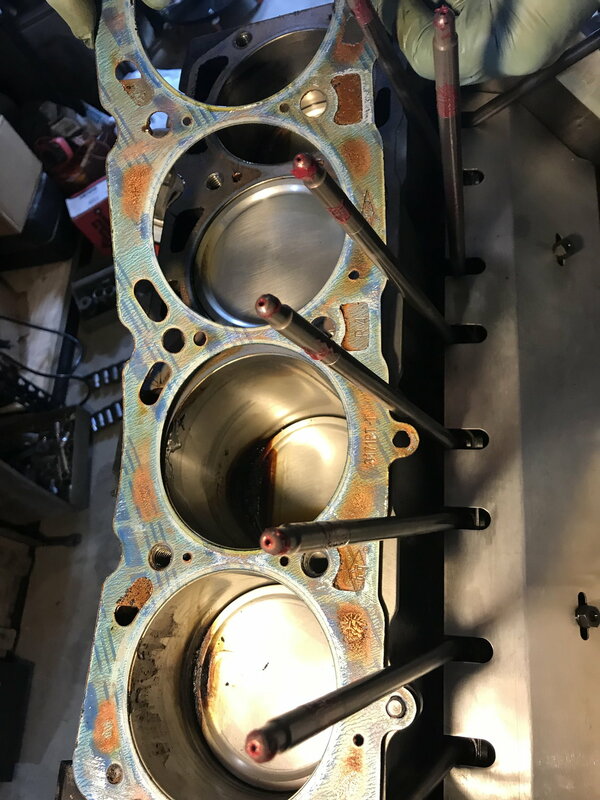 Head gasket replacement - I am betting this was assembled with a fel-pro or other fiber/steel composite head gaskets, and I am thinking this is another place/way that I can up the compression. What head gaskets do Olds builders like lately that are thinner than .040 that seems to be the standard? 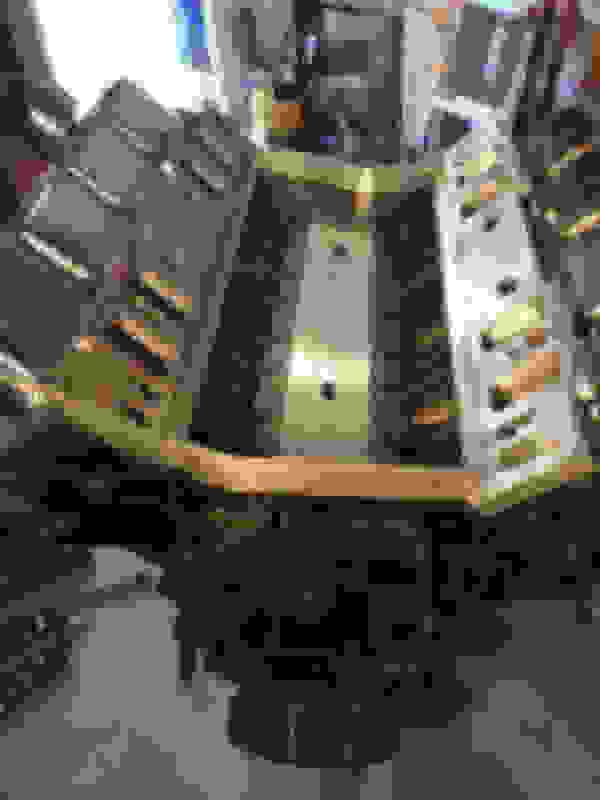 I have used cometics with good results on lots of other engines that I have built, but I haven't tried them on an Olds. 6. Balance rotating assembly.... I know that this will be required, again...... My next thought is, should I switch it all to internal balance? Last edited by Battenrunner; June 20th, 2018 at 08:41 PM. I will work on getting pics of the engine as we begin the tear down. We borrowed an engine stand from a friend today, but didn't have time to mount the engine on it because of my work and because the stand was left out in the weather for years and we had to get everything freed up from rust. BTW- I like your car! This is going in a mostly street/ Pro-Touring/some-strip 1967 Olds Cutlass 2dr. Hardtop with a 400 trans, 2800 converter, 3.73 12 Bolt Chevrolet rear with all the good stuff, adjustable upper A-arms and poly bushing lower boxed arms. 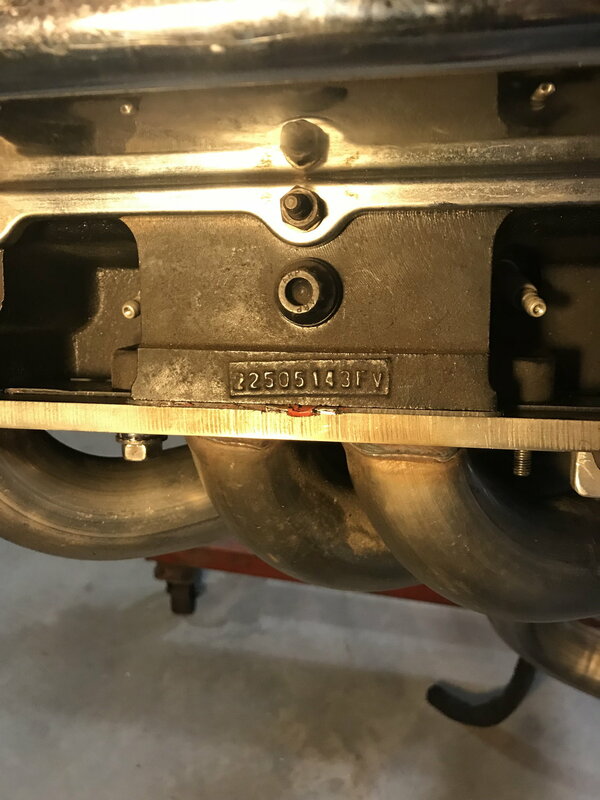 We also have a Professional Products dual plane intake with the fuel injection rail kit that we plan on running, hopefully it won't choke the heads out... Use an RPM and bung it yourself if possible. Holley Street Dominator works well too. We have a Motec M8 fuel injection unit and harness that we will be utilizing for this setup, along with 43lb Bosch Green Giant fuel injectors. We also have a set of custom American Racing Headers with 1 7/8 primaries and 3 inch collectors with custom stainless Batten flanges. We also have a 4 inch bolt-on cowl hood, so induction height isn't a problem. You have this backwards, you need something tighter, not wider. And I'd have the heads flowed so you can really determine how much lift would be most beneficial. And those old green top injectors aren't the best. You may want to opt for a newer design. 3. After reading too many horror stories about the stock or reworked connecting rods failing or causing failures, I think we are going to buy some form of H Beam aftermarket rods, Yes but I haven't settled for sure. Also, if using a stock 4.250 stroke crank, if I wanted to use GRP aluminum rods, will that require notching the bottom of the cylinder bores? I wouldn't use those, they're not as street friendly as some will lead you to believe. I don't know if the stock rods were bushed for floating pins or not, but I would assume that the Arias pistons would have provisions for locks (I hope). Thanks for your tips cutlassefi, I am confused as to why you think I need a narrower lobe seperation cam with EFI and low air density, can you elaborate? Also, these are the genuine (Not Chinese) Bosch green giants and are a newer style injector, as used on newer turbo and supercharged engines with a green plastic body part number 0280155968, not the old green plastic top with metal lower body injectors. Last edited by Battenrunner; June 21st, 2018 at 07:50 AM. Early and tighter builds cylinder pressure. Wider and later looses it. And with an M8 you should be able to tune around any unsteady MAP signals due to the overlap. And gotcha on the injectors. Rule of thumb, always use the smallest injector with the most pressure possible. It'll normally run better that way. 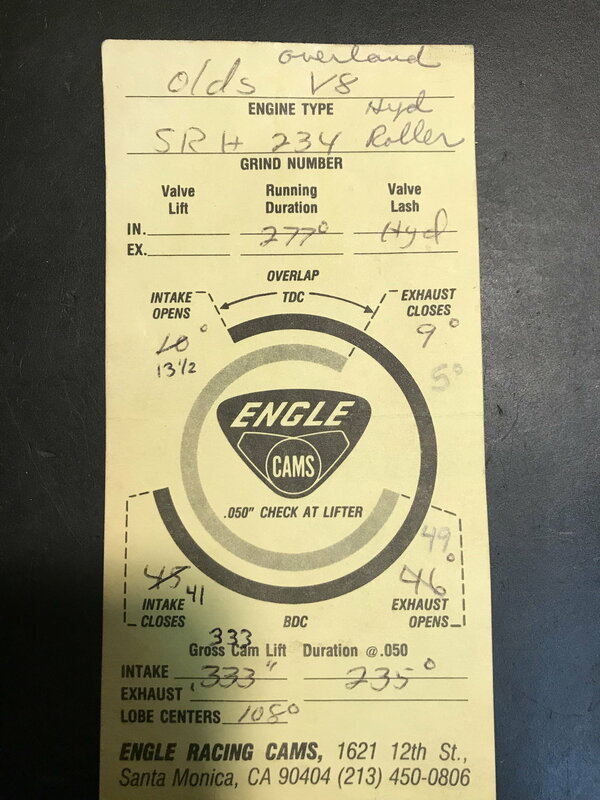 I guess my other concern is that we are also strongly considering running a vintage air A/C system, and I know the narrow lobe sep cam may play havoc on the idle tuning, even with the Bosch IAC and using the Motec to bump the idle up when the A/C is engaged. 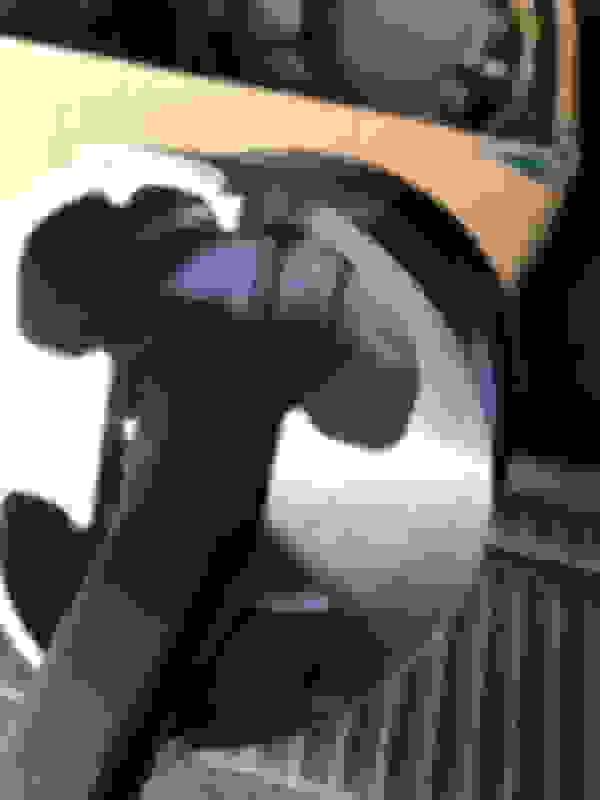 Last edited by Battenrunner; June 21st, 2018 at 09:00 PM. in Denver with your drive train set up, tight converter and 3.73 gear. Aluminum rod is also a bad idea. Last edited by VORTECPRO; June 22nd, 2018 at 05:05 AM. Balance card reflects an old ring pack and pressfit rods. And the IAC only raises the idle, not steady it. PROJECT SNOWBALL IS IN EFFECT! Last edited by Battenrunner; June 22nd, 2018 at 07:48 AM. Sure, I know that idle quality will be ultimately dictated by cranking compression, dynamic compression, cam timing advance or retard, the ignition advance curve, injector PW/ injector timing, and fuel pressure. HMMM UNFORTUNATELY NO IT WONT. IT’LL MOSTLY BE DETERMINED BY HAVING THE CORRECT SIZE INJECTOR, THE ECU’s ABILITY TO MANAGE A SHORTER PULSE WIDTH AND WHATEVER IDLE SPARK CONTROL MOTEC HAS. With the right system and tuner these concerns should be of no consequence. Last edited by cutlassefi; June 22nd, 2018 at 05:01 PM. Holy Indian Head copper gasket shellac Batman! 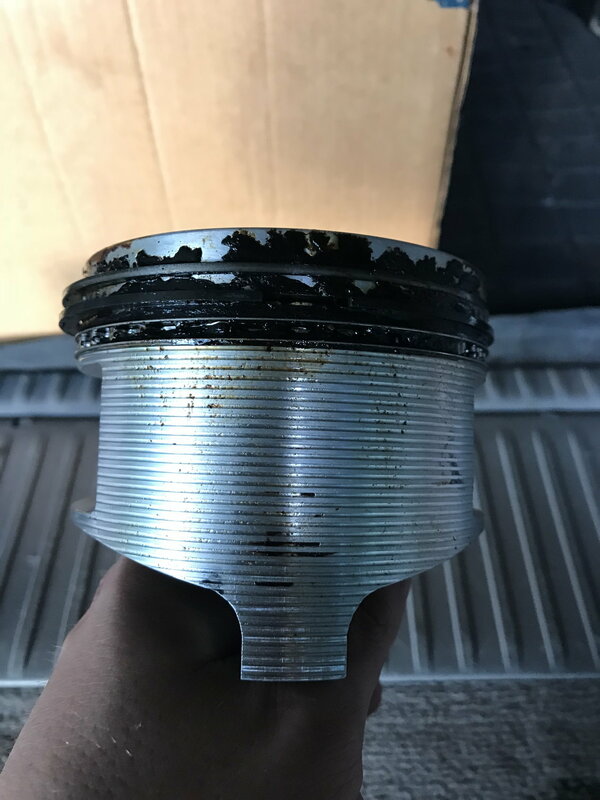 This crud was everywhere on the edges of the bores and it was hardened into big chunks on top of the pistons.... even more reason to tear this thing down. 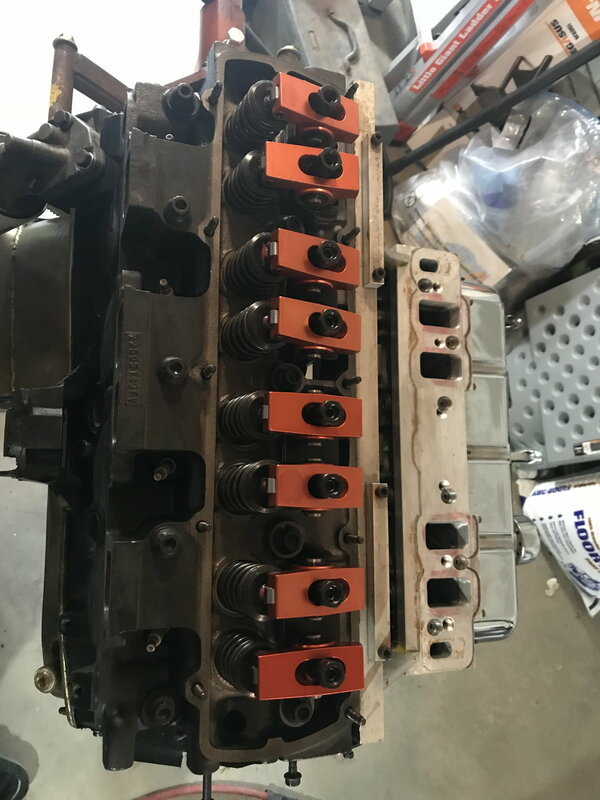 Typical Fel Pro 8171PT Head gaskets (.040 compressed) nice 3/8 pushrods though! Check out the internal block polishing/deburring and the Hydraulic roller lifters.... very nicely done. The block has also been completely polished and deburred on the exterior as well. Last edited by Battenrunner; June 22nd, 2018 at 04:58 PM. Good move on the flow testing. Don’t really look like the Sealed Power/TRW pistons, maybe an altered version?. Yeah, I am excited about flow testing. Nope, like I said at the first post, this engine has Arias pistons, not TRW’s. Last edited by Battenrunner; June 22nd, 2018 at 06:51 PM. I've run extremely hard in Denver with a little less than 9.5 comp, with way less cam, less engine, maybe you should try the engine as is or at least get it on the dyno and see what you got there. We can take care of those clearance issues as well. 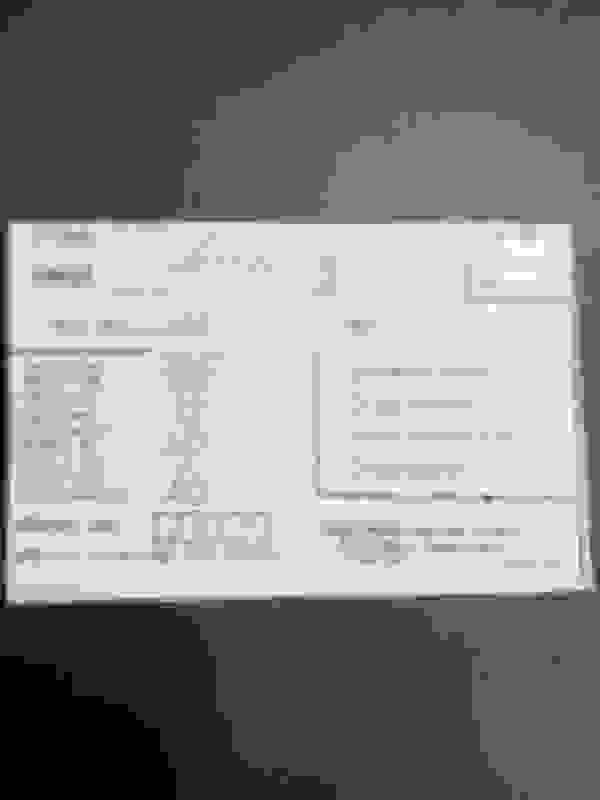 Last edited by VORTECPRO; June 22nd, 2018 at 09:03 PM. Well, Vortecpro, not to get soft on you, but my reasoning for this refinement and worry is that this engine and this Cutlass is the last project that my Dad and I will ever get to work on... we have done many together, but this will be his last. He has dementia and it is getting worse quickly, so I would like to get this done right and try to enjoy the car without it breaking down or being a disappointment once it is built. He is a retired social worker for the elderly and disabled, a Vietnam Vet, and most importantly, he is a wonderful person and awesome father to boot...... So I want it to be fun and impressive for him before he can no longer enjoy it. At this point, my 5 year old boy, myself, and my Dad have been working on the car lately, and I can really see the joy in my Dad's eyes when we are all together. 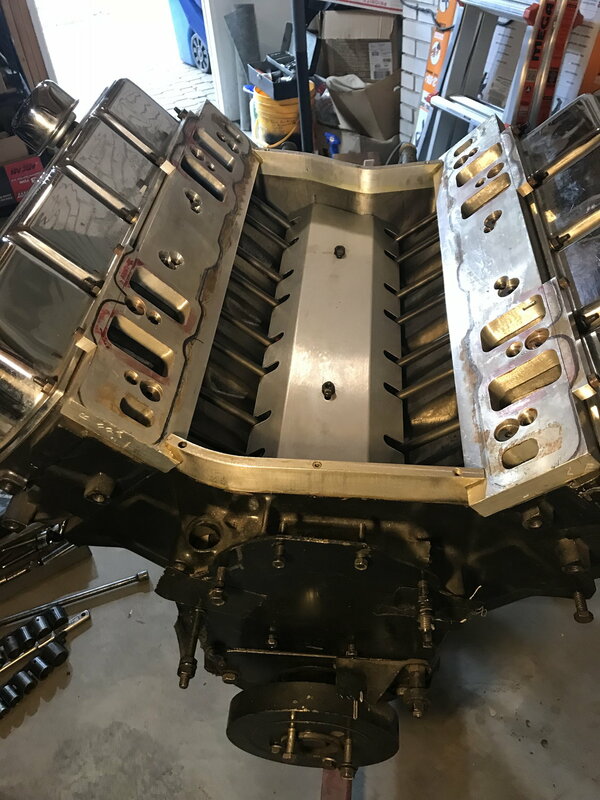 We have all been so low on money for so long, that this project has been around for more than 15 years..... slowly saving money and gathering parts (like this engine), have taken a long time and a lot of hard work. The money still hasn't gotten much easier, so we are still on a budget, but it just means having to put other things off for now to get our priorities taken care of. I would really be thrilled to see this car hit the 11's in the quarter here at high elevation, and I know my Dad would be on cloud nine if it did as well. I understand your thought process. I just see many people never actually get to the track building a better power plant, for me its about having fun, and surely I won't spend a fortune to run 11s, that's much less than 400 observed HP. Since the 1980s I've been involved with or seen several different Oldsmobile's that run from 10s to 12s @ Bandimere. Myself my 9.3 comp 467, peanut port heads, 228 @ .050 hyd cam, stamped rockers ran 10.90 @ 3720 @ Bandimere. Heres my point, that engine will run 11s with some minor adjustments, but make no mistake about this: the money should be going to the drive line to reach your goal. So Vortecpro, we’re going to go down this road again? You run bbc’s, we run Oldsmobile’s. Please don’t try to compare the two. Op- yep missed the piston description sorry but you can measure the width and depth of the dish and get a real good estimate. Then just do the math from there. i think most of your combination is good, you just need to verify what you actually have is correct. Last edited by cutlassefi; June 23rd, 2018 at 05:13 AM. That engine was built a few years back, it went into a 1970 442 convertible 3.23 gear, fully loaded car with air conditioning, turbo 400. I went with the owner to the track 1 time, he ran 12.06 @ 119 MPH with 275 drag radials in full street trim, 27.80 baro 2130 feet elevation. He was 70 plus years old and became sick and we never got a chance to dial the car in. 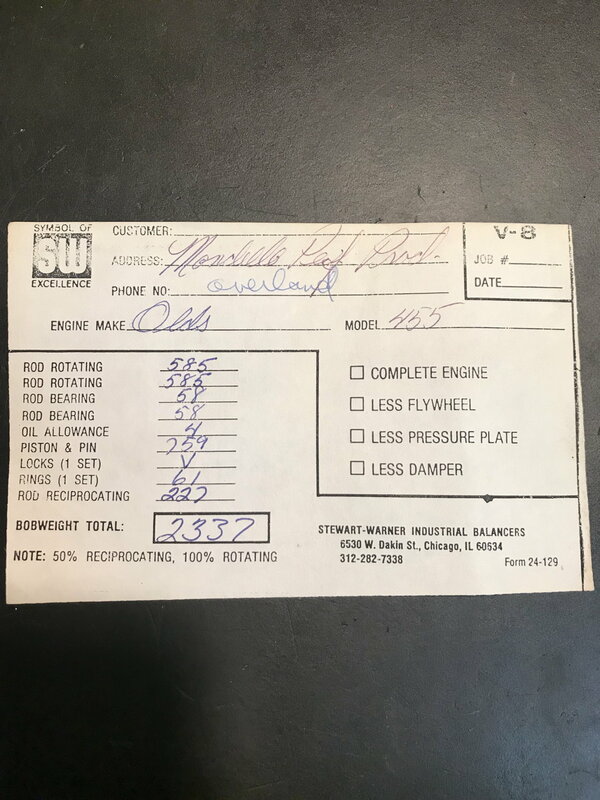 I've built and machined and tested a few 455 Olds street driven and raced and been pretty successful with them, and NEVER have seen the carnage you have. Last edited by VORTECPRO; June 23rd, 2018 at 05:23 AM. Give us some engine specs/details. Anybody can post the same thing you just did. So he ran a 12.06 with the air on OR it had AC? You haven’t changed, you’re still a tool. Last edited by cutlassefi; June 23rd, 2018 at 05:55 AM. Last edited by VORTECPRO; June 23rd, 2018 at 06:27 AM. Lightened CP pistons, 1.5 1.5 3.0 Compression? Are these the heads that you did or the ones you tried to pass off as yours but really weren't? This is the same build you posted somewhere else on here. The guy was 100 years old and blind but still ran a 12.06, now I remember. Last edited by cutlassefi; June 23rd, 2018 at 04:20 PM. Actually I'm not a liar like you. Aren't you the same one that tried to pass off some heads as yours on ROP but they ended being done by Harold Bettis? Yeah I'm real sure that was you. You got caught redhanded in a lie. You're less than honest at the very least. So why would anyone believe what you say? Bottom line is you cater to a different group. The majority of your customers are BBC guys who's main focus is drag racing. My customer base is largely Olds guys who don't go to the track and just want to enjoy their cars on a daily basis. Apples and oranges. Just the facts. 4. I have no desire to have anything to do with your customer base. 5. Panos's was your customer and his experience was anything but enjoyable. 6. All the heads I post about are done by me in my shop. Last edited by VORTECPRO; June 23rd, 2018 at 04:15 PM. Ok you 2, don't muck up a nice thread. Take your differences to pm's. I never start it. Just giving solid advice. THANK GOD I decided to pull this engine down. Every Clevite 77 P series rod and main bearing had a couple of slight polished areas (likely from the dang clearances being way too tight), but the Forged 455 crank has only been turned .010/.010 so far. There was trash in every oil galley, but I didn't see any in the assembled rotating components. Between the crap on the rings and pistons being hard as a rock, and gumming up the rings and the cylinders and creating extreme drag, the oiling hole-less plug in the back of the block, and the way-too-tight bearings everywhere, this thing was guaranteed to be ruined shortly after starting up. It does have ARIAS speedmaster pistons, which I took to the head shop today with the heads. We are going to have the heads milled and the guy is going to CC the chambers first to verify the compression ratio we have now. We did plate it and use the burette to verify the CC's of the piston while I was there, and it checks out at 23cc's of dish volume. 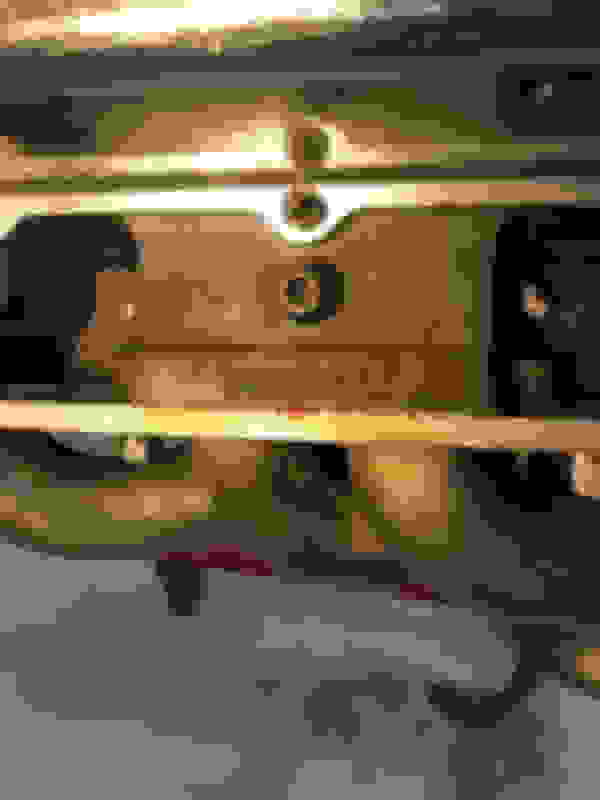 I am pretty sure we are going to send all the bearings off to have them Polydyne coated, and we are going to have the crank clearances for the bearings ground into it unless someone can really talk me into stroking this crank......... Apparently, the crank shop here is very good and very reputable and affordable. So, I can offset-grind/stroke the Forged 455 steel crank by .200 more stroke to attain a stroke of 4.450, and I can use/modify a set of 6.635 eagle rods by narrowing the little end by .062 width, pressing in new eagle undersize wrist pin bushings, and have them honed to fit the Arias pin sizes of .980 (vs. .989-.990 of the factory BB Chevrolet size). I believe the pistons we have may clear the crank weights, but if not, the weights can be profiled by the crank shop as well. Can someone verify if I would have to grind the block for rod bolt clearance if it was stroked? Otherwise, if we don't stroke it, we will use the Eagle Oldsmobile replacement rods and have the crank ground for proper clearances, then internal balance it with an ATI balancer (or other quality unit) and some brand of SFI approved flexplate for internal balance. Can anyone tell me the ins and outs of using the ATI balancer with stock pulleys, etc. ; does everything line up fine, I just have to grind some extra clearance on the water pump and use a different pointer ? Any guesses on what the extra .200 of stroke would be worth for power? The cylinder heads are being flow tested and should be finished by Wednesday, as well as flow testing the Performance Products Hurricane EFI intake attached to the head ( I want to see how much it flows when bolted to the head, and we are going to have two ports tested to see how the lower ports flow). Last edited by Battenrunner; June 23rd, 2018 at 07:41 PM. I don't like the idea of extra stroke, you limit the cylinder head then theres the windage issues. 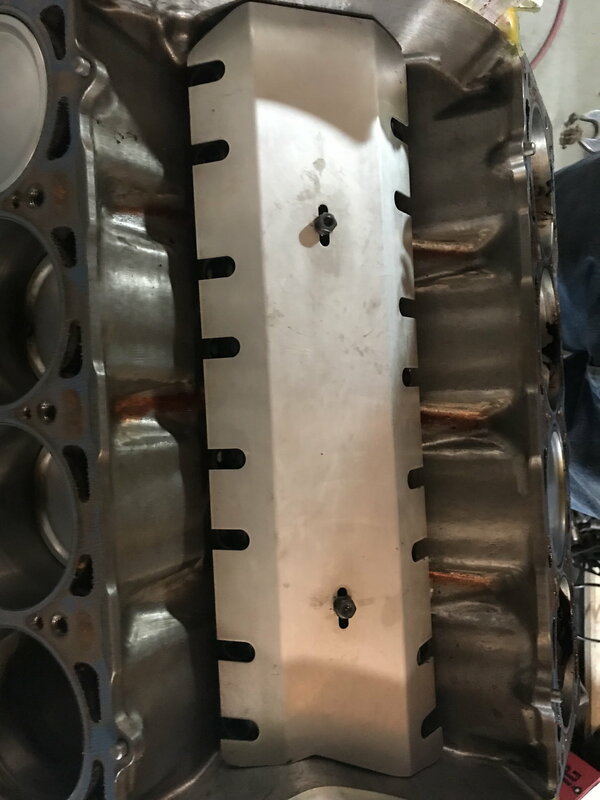 What size intake valve do these heads have? The intake valves are Manley severe duty pro flow 11824's, which are 2.055 diameter. 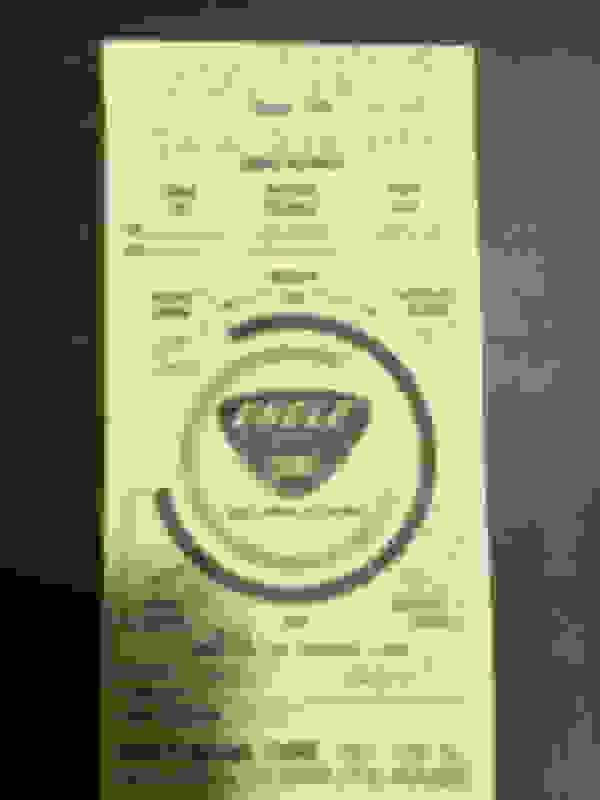 It has Manley severe duty 11805 Exhaust valves, which are 1.71 diameter. That 2.055 isn't big enough for cubes already, as you know. The crank can be ground to set the clearance easy enough, I would ck the stroke to see how far off it is, if it off I'd correct it with a regrind, we cut the counter weights down on the last 455 we did. I know your plan is to take that crank over to Dave....make very sure he doesn't have his wife grind it. Stock rods I oval hone, bearing problems are gone at that point. Yeah, the intake size seemed small to me..... but, I want to see how they flow with the 2.055 valves. May be good enough to not worry about doing more. I think the intake will be the real choke point of the intake tract anyways...... so we are looking at selling the Professional Products setup to someone with a more stock setup and possibly going to an intake with more cross section (Holley Street dominator or Edelbrock Victor) to match the heads and modify it for injector bungs and rail mounts. 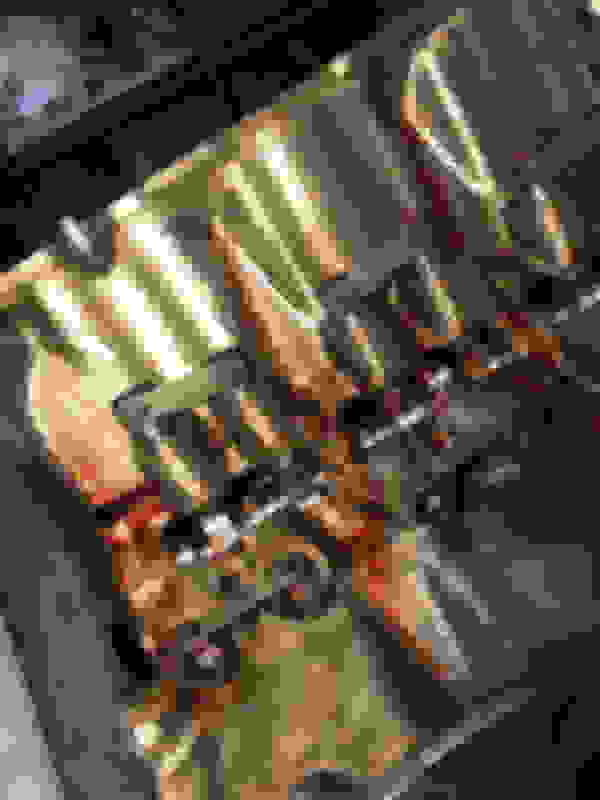 Are you talking about Mile High Crankshaft grinding? I spoke to his wife, and she was very nice, but she acted like it would be him doing it as it is sensitive work to sneak up on grinding extra bearing clearances or offset-ground stroking. I relayed how important this crankshaft is to us and how hard it is to obtain them in good shape, so she seemed to understand. Since we are this far down with it, we are going to go Eagle rods to eliminate any worries with the rods. I may also spray this engine with some Nitrous in the future, or do some type of supercharger, so I don't want to be on the edge of the current weak component capabilities. 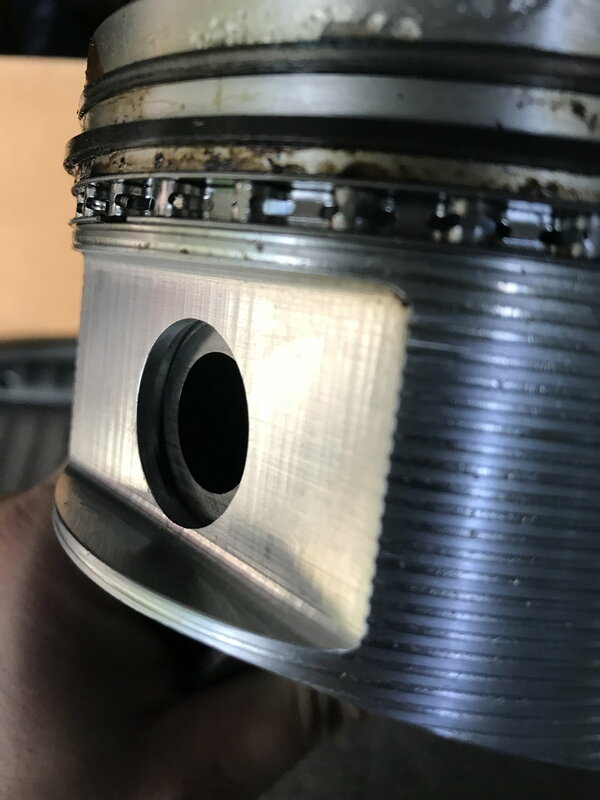 This gets those pistons off safely............the question is, do you really want to save them? Last edited by Battenrunner; June 23rd, 2018 at 11:27 PM. Adding stroke won’t change the windage much if any on this setup. You’re not adding counterweight, nor are you adding rod throw mass in the crank, you’re just moving the rod out a bit by the offset grind. And you’d be using a rod with a smaller big end, so that’s actually better. But that’s your call. And adding cubes will limit a head, but you don’t even know the flow numbers yet so I’d make that decision after you have all the facts. But I would use the available 2.125 intake and have the bowls blended for it. If they’re anything like the other aftermarket heads, they’ll be big enough already. Too bad it has the 1.71 ex though, don’t need that, I’ve made over 600 with the 1.68, no problem. And dont cut the counterweights. Internally balance it and you’ll be fine. if anything send it to Moldex and they’ll lighten the rod throws etc., otherwise leave it alone. Last edited by cutlassefi; June 24th, 2018 at 05:35 AM.